The chances are that if you are visiting Giulianova, you are there for its beach, seafood and ice-cream, few of its international visitors know that it’s part of the Colline Teramane DOCG wine region, which stretches from the coast to the bottom of the Gran Sasso mountains and is noted by experts for producing the best Montepulciano d’Abruzzo wines. We, however, were on a white wine mission, fuelled by a mother-in-law whose migraines counter any enjoyment of reds and seeking a complex Trebbiano d’Abruzzo. Could we find depth and character amongst these limestone and clay foothills in the tradition of the acclaimed Valentini? 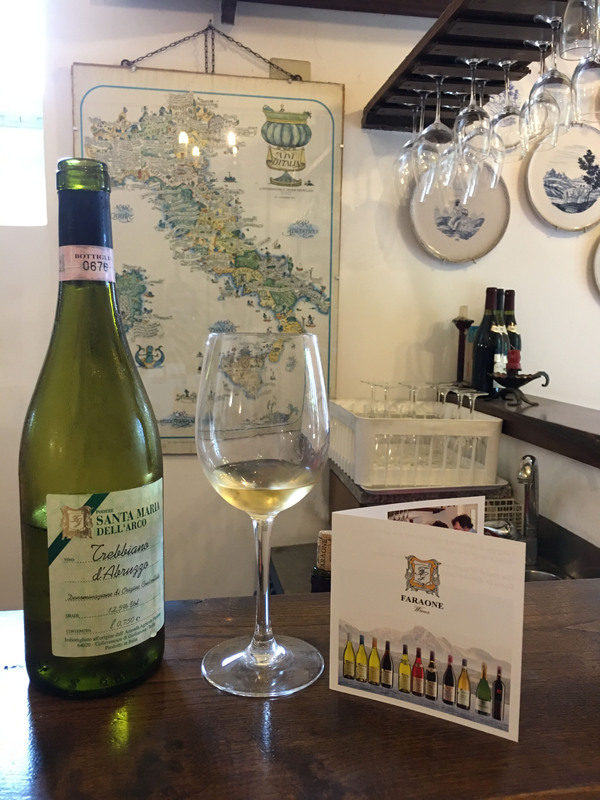 This cantina’s award-winning Trebbiano d’Abruzzo wines are matured for over 5 years and leave the ‘light and crisp’ interpretations of this grape in the shade. Drive out of Giulianova past the blast of primary coloured dinghies and inflatable bananas for sale on the side of the road and the last of the tabletop stone pine trees that announce you’re leaving the seaside and you’ll see residential houses and a small sign that advertises Faraone, (Faraone being Italian for Pharaoh). From the side of the road, it looks to be a small family farmhouse rather than a cantina of note, but as so often in Abruzzo where you should never judge by appearances, this houses the rich wine making secrets of a family who have been making some of Abruzzo’s most complex, aromatic white wines commercially since 1916. Pop in wine tasting here is not the flashy all bells and whistles experiences that are offered by the larger vineyards, no sweeping views of vines, nor cheese and salami pairings, after all, this is a small family winemaker whose 9 hectares produces only between 50-60,000 bottles each year. However, what you are guaranteed is an intimate and comfortable wine tasting that reveals just how incredible Abruzzo whites can be. The owner, Giovanni Faraone is jolly, his laughter lines furrow a little deeper as you taste and savor your appreciation of his family’s soulful wines, there’s something contagious and feel good from seeing the smiling pride he has of his wines. Apparently, the secret to the success of the grapes grown within the Colline Teramana is due not just to the mix of mountain and sea air but the 5 rivers that criss-cross the area helping to keep them cool in long hot summers. Faraone’s organic grapes are handpicked and divided into 2 labels, its younger wines, Le Vigne di Faraone and the reserve Santa Maria dell’Arco, do try both to compare the differences as well as their Pecorino and Passerina from those ancient Abruzzesi grapes, Pecorino and Passerina. A luminous lime-green gold, the nose pings with root ginger and citronelle, of candied citrus fruit even. Precise yet unhurried, the palate charms with lime skin zest, with essential oils and sapidity. The tidy but intriguing nose of acacia honey, lemon zest, aniseed, even of mandarin and apple core, is refreshed by Adriatic sea- wish that international restaurants stocked more of this than their lighter cousin and your local wine dealer would embrace the complex as well as the light. 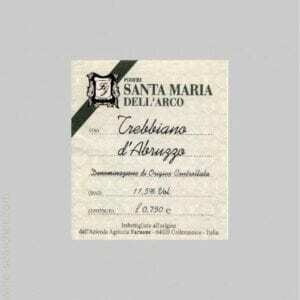 We left wishing that international restaurants and wine dealers stocked more of this type of Trebbiano d’Abruzzo and embraced the complex as well as the light. We gifted a bottle in Tuscany to a friend who has a second home in Abruzzo. Now on their journey home, they always swing by to buy a few bottles to take home with them, no mean testament when we all know the reputation of Tuscan wines. Kurt, we should check this out. Am excited about my upcoming trip to the region and I’ll be sure to hunt this Trebbiano down. Thanks!